On alternate Wednesdays, Katherine’s friend Jasper comes over after school and yesterday’s visit was a foray into mask-making. 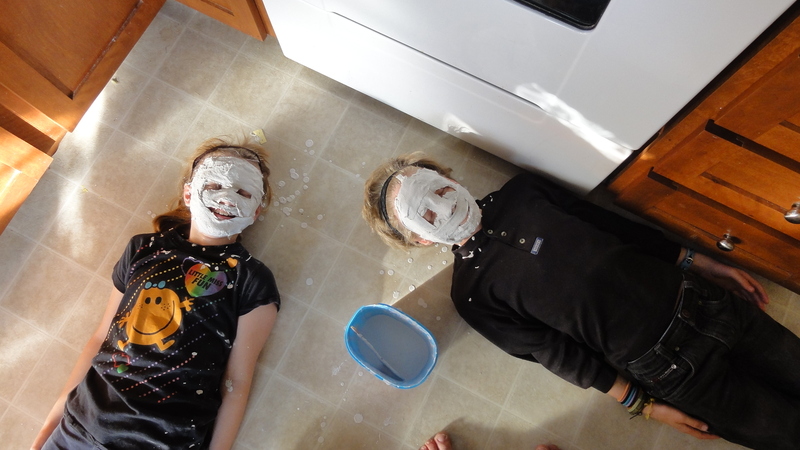 We tied back hair, slathered faces (including eyebrows) in petroleum jelly to protect their skin and had a very firm discussion about the virtues of staying still and keeping one’s eyes closed during the process. 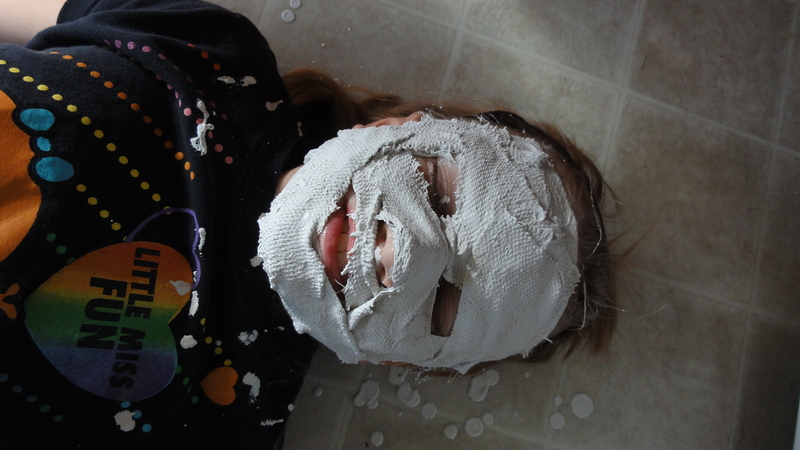 Note: Plaster of Paris is neat stuff, but can be hard on skin. The petroleum jelly barrier was essential, as were the admonitions against doing ANYTHING that might result in plaster in eyes. Not all kids would be suitable for this sort of a project, but Katherine and Jasper are enthusiastic, yet sensible, and they listen quite well. So I mixed up the plaster and soaked strips of gauze bandages in it. Just for a lark, I also soaked strips of heavy-duty paper towels, of the sort used in workshops and garages. The paper towel created a much smoother finish and I’ll probably use it in similar adventures in the future . The strips were thoroughly wrung out and laid all over the kids’ faces, missing the eyes (of course) and allowing apertures around mouth and nose. Katherine and Jasper, lying still. It's a very temporary situation. Actually applying the strips took very little time, but the imps had to lie flat on the floor for about 15 minutes, until the masks had set enough to come off their faces cleanly. There was much giggling, but the plaster eventually set and there were no disasters. 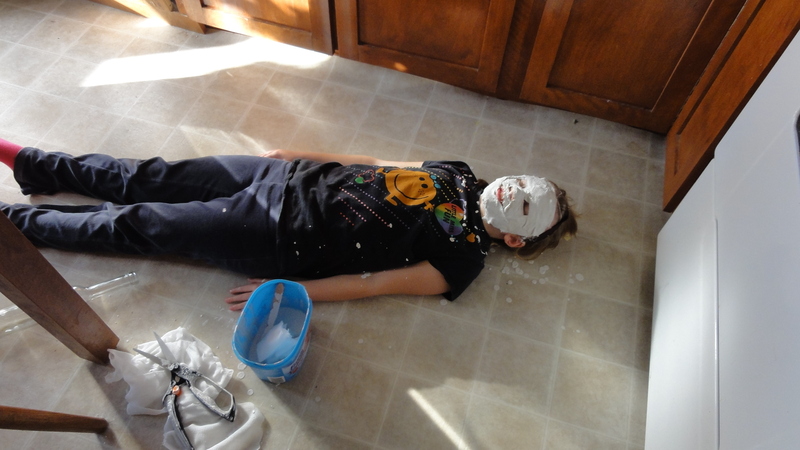 The masks were set aside to dry and I spent the next ten minutes scrubbing faces and hair free of that wonderfully goopy combination, plaster and Vaseline. The next phase is for them to decide what the final caricatures will be and to start building the requisite physical features (snouts, ears, eyebrows, hair, etc) and creating surface texture. 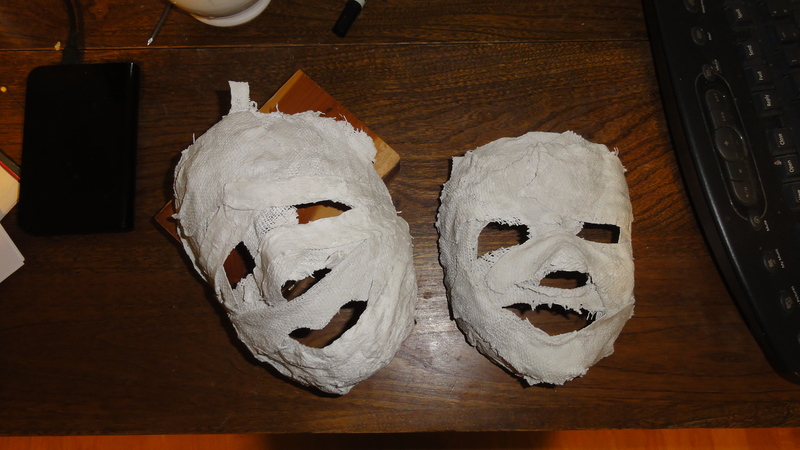 Finally we’ll paint and varnish them and attach some sort of elastic or ties for affixing them to one’s head.